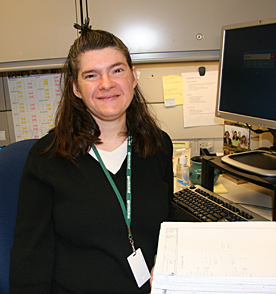 Success stories about people with disabilities in the workforce served by Puget Sound Personnel (PSP). PSP is proud of the partnerships we've forged with the people we serve and outstanding area businesses who value the contribution of a diverse workforce. 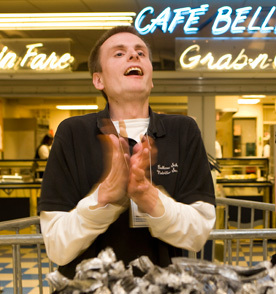 The following success stories illustrate how working empowers the lives of people with disabilities while contributing to the character of our communities. Since graduating from the transition program at Bellevue High School, Jesse has had a personal goal to work in an office setting. PSP helped Jesse find his first paid employment in a café setting and customized some office tasks in the catering department with Eurest Dining Services where Jesse could utilize his computer skills. After developing his skills and getting some work experience under his belt, PSP was able to partner with the City of Bellevue to create a supported employment position in the Utilities Department and, most recently, in the City Attorney’s Department. Jesse is helping to archive files and complete data entry and scanning tasks. With the help of PSP and his supportive co-workers at the City, Jesse has grown both personally and professionally. He feels challenged in his role as an administrative helper and encouraged to try new tasks and trust in his skills. “It means a lot to me that I have a job that I love, surrounded by amazing co-workers in a great work environment,” commented Jesse. His parents are also very pleased with the direction that Jesse’s career has taken. They credit PSP and his work with the City of Bellevue for enhancing his self-esteem and allowing him to become a productive and valued member of the community. When you ask Joe about his new career at the City of Bellevue’s Department of Transportation, his pride is evident when he says with enthusiasm, “I love my new job!” Joe’s employment involves a committed support team made up of PSP staff and champions at the City. 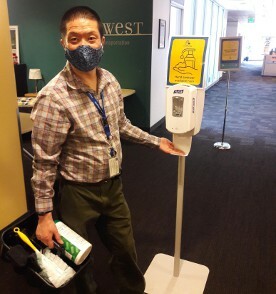 Joe is the first supported employee hired under a program developed by the City in partnership with Puget Sound Personnel. After working in a hospital for many years, Joe was eager to advance his career and work in an office setting. Joe expressed to PSP that he wanted to work in an environment where his wide range of skills would be utilized and valued. In partnership with the City of Bellevue, PSP was able to customize a perfect fit for Joe. Joe’s enthusiasm in performing such tasks as cleaning conference rooms and delivering mail has provided great value to the department. Joe truly loves his new job and is incredibly proud to be an employee of the City of Bellevue. PSP looks forward to supporting Joe throughout his exciting new career! Read more about Joe’s impact on the City of Bellevue and its embrace of diversity in the workplace. Click here. When Alexa first met with PSP in 2004, she knew that her favorite coffee shop would also be the place where she found her dream job. 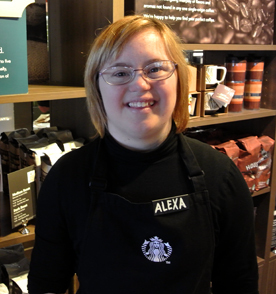 After working as a Lobby Attendant at the Issaquah Gilman Starbucks for 10 years, Alexa now works on the Hospitality Team in Starbucks Corporate Office. Starbucks employees and visitors can count on Alexa's engaging spirit and professionalism to brighten their day. After expressing a desire for more work hours and added challenge, PSP developed a second job for Alexa as a hostess at Applebee’s in Bellevue in the fall of 2009. As the first and last face patrons see when going through the doors, Alexa makes sure that every customer's experience begins and ends in a positive manner. Her work ethic, attention to detail and love for people have helped make her a workplace success with customers and co-workers alike at both job locations. And, that's a double tall order to fill! There are some smooth moves going on in Café 43 on Microsoft's Redmond Campus. To find them, all you have to do is look for Holly attending to her job as a food service ambassador for Eurest. You'll know her by her warm smile and positively rocking dance moves as she buses dishes and keeps the cafeteria as sparkling as her personality. 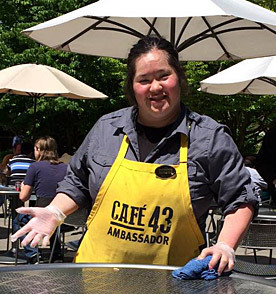 Holly joined the Café 43 team in June of 2013. Prior to that, she held a much less demanding job working only three hours per week doing a very repetitive task. Today, Holly is challenged in an interesting and engaging environment and is thriving. Her confidence and skill set have grown along with her work shift that puts her in the heart of the lunch time action Monday through Friday in this busy cafe. With ongoing support from her PSP job coaches coupled with the encourage-ment of her co-workers and supervisors, Holly has simply blossomed in her dream job. In fact, her employment success has her dancing for joy! With great pride and a big smile, David will tell you, "I'm a working man, now!" Securing paid employment after building a long resume of volunteer experience was something David was adamant about when he first came to PSP. A job was developed for him in 2011 with Rite Aid where his responsibilities included restocking misplaced items, facing shelves and greeting customers. 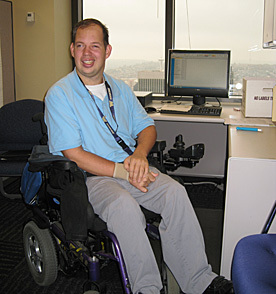 Seeking both more challenge and enhanced opportunity for David, PSP was able to find him work in the Personnel Department of the City of Seattle. As an Office Maintenance Aide, he performs data entry, maintains the copy machines and helps on special projects. His goal is to continue building his skills and to take on expanded work hours with the City. Outside of work, David likes to stay busy and is involved in a variety of activities including Young Life, Boy Scouts, karate, horseback riding, downhill skiing and travel. While he spends a lot of time with his family, David is enjoying the independence of living in an apartment with a roommate. Ask Laila what makes her proud and she'll quickly say "having a job at Microsoft!" and she'll follow that declaration with a big grin. Laila's feeling of accomplishment is well deserved for she has built a career at the company that spans over 20 years and counting. She began her tenure as a file clerk in the company's corporate purchasing group. When her department's responsibilities were outsourced to another state, PSP was able to customize a position for Laila in the mailing services group run by Pitney Bowes. Working in the mail/sort room, she diligently sorts the inner office memos and mail into the various bins for all the Microsoft buildings. Her knack for numbers translates into accuracy and efficiency in her work where she takes pleasure in finding and correcting errors to keep company correspondence moving along smoothly. Laila's positive attitude and winning smile are real assets to her department. Her coworkers appreciate her hard work, dedication and willingness to help out with special projects. Laila, in return, gets great satisfaction from "being a professional" and working hard every day to do her very best and make her teammates proud. Wil proudly wears the coveted "blue badge" of a Microsoft employee with benefits. As a computer Lab Assistant, Wil is working his dream job and feeling "as light as a feather" as he puts it, thinking about what he has accomplished. And that is much. Wil's pathway to employment involved a committed support system made up of his parents, teachers at the Issaquah School-to-Work program and, most recently, PSP. In his last year of transition, Wil and his parents faced a critical decision. They needed to find an employment vendor willing to "think outside the box" to ensure Wil's aptitude for computers and his artistic capabilities would be put to work to grow his potential. After interviewing several vendors, the family selected PSP because they felt, "PSP had the professional presence and forward thinking to partner with the kind of companies that could provide Wil with the work environment he desired." Read more about their endorsement of our services. Click here. Given Wil's interest in computers, Microsoft seemed like a great fit. Working creatively, we developed a position for him as a contract employee. One year later in 2012, Wil was given a raise and asked to join Microsoft as a permanent employee. 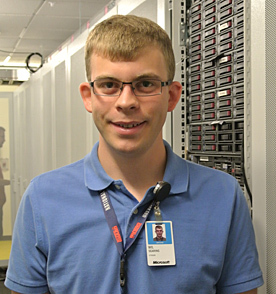 Wil's job placement made him PSP's 29th supported employee working on the Microsoft campus. Bellevue High is familiar territory to Steve who has worked a two hour shift four days a week at his alma mater since 2007. While some may view him as having significant barriers to employment, a circle of caring and support keeps him on the job—working in the cafeteria, collecting recycling and dusting in the library. Getting paid for his hard work was a source of pride for Steve. However, when financial cuts in 2009 eliminated his wages, Steve stayed on as a volunteer. Being productive and interacting with people were things he just wasn't willing to give up. In an effort to build Steve's independence and strengthen his natural supports at the school, Steve's PSP job coach, Maggie, worked with BHS to enlist the help of Student Aides. Each semester a new student will be selected and trained by PSP to provide Steve with the job supports he needs while increasing his integration and socialization into the school environment. It was a great solution that provided benefits for all concerned. But, Steve still didn't have a paycheck. Again, a coalition of caring people came to the rescue. Led by Maggie, BHS students, parents and friends, a fund raising campaign quickly raised donations to cover Steve's wages for more than two years! With the value of his work clearly reinforced, Steve is enjoying his job and expanded social interactions to the fullest. Over the last 22 years, PSP has worked with Joe through several different career moves. Each of Joe’s career upgrades was driven by his impressive customer service skills and great work ethic. 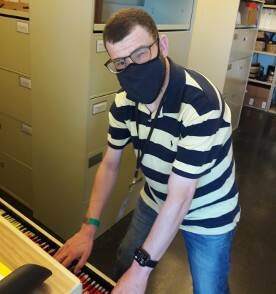 Joe currently is employed as a customer service associate at Novitex/Exela where he works in a team environment to complete warehouse duties for Microsoft’s packaging department. 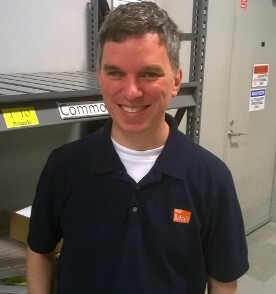 His managers can depend on Joe’s dedication and positive “can do” attitude to help the team succeed―whether it’s staging packages, moving pallets in and out of the warehouse or keeping items moving from the processors belts to the driver racks. Joe has thrived in this work setting and enjoys the comradery that he has developed with his co-workers. “I love working side-by-side with my amazing team,” Joe explains. “They make my day fun!” Joe is also very proud to say that his career has allowed him to move into his very own apartment. He is enjoying every minute of his independence in both is career and his home life. How has working changed Adam's life? For starters, he's building a satisfying and challenging career with a decade of employment experience at Pitney Bowes. Working in the mail room at Microsoft has also given him the stability to move into his own apartment and become self sufficient in so many ways. Before Microsoft, Adam worked only four hours a week at a movie theater where his skills were underutilized. PSP knew that Adam's next placement had to tap into his talents, including his exceptional computer skills, great memory and attention to detail. The job developed for him within Pitney Bowes has allowed him to stretch his abilities and take on new challenges over the years. In 2012, Adam's duties expanded to include processing packages in the receiving department. The quality and accuracy of his processing abilities are outstanding which comes as no surprise to those who know Adam is an avid game show enthusiast who has a talent for facts and figures. Adam's co-workers, managers and PSP all recognize the value he brings to his team. His determination to always give 100% is just how he approaches what he considers a "fantastic" job—a job that has been a true life changer. Jo wanted to work in a team environment where her strong work ethic, excellent people skills and enthusiasm would not only be valued, but would make a difference. PSP met with the Seattle Department of Transportation to develop and customize a position for Jo that would match her skills and interests and provide essential services to the department. In September of 2009, she joined the City's Policy & Planning Division as an Office Maintenance Aide and has enthusiastically taken to her new career ever since. Jo is responsible for collecting and delivering the mail, copying and scanning documents, maintaining office paper supplies, cleaning the conference rooms and lunch room, and handling special projects. In addition to offering continued job coaching to Jo, PSP helps her coworkers provide the supports needed to ensure her continued workplace success. Jo truly loves her job and says she wants to work in Policy & Planning for a long, long time. Given PSP's commitment and Jo's strong work ethic, it looks like she is in for a sustained and satisfying career. Mohamud is a Courtesy Clerk at the Safeway store near his home in Rainier Valley. He speaks Ethiopia's second language, Oromo, and is currently enrolled in English language classes. Despite the cognitive challenges and the language barrier that he faces each day, Mohamud offers the brightest smile in Seattle. Customers at his Safeway ask for him by name to assist them to their cars after he is done bagging their groceries. He escorts the elderly and disabled to their vehicles and returns their motorized carts to the store when finished. When Mohamud hears a request for a clean-up over the intercom, he quickly responds with a mop, broom and slippery floor warning signs. His supervisors and his company rely on him to keep the customers safe and the aisles free of dangerous debris. Puget Sound Personnel and Mohamud have been working together since 2006 when we met him in our School to Work program. PSP helps him learn new tasks, coordinates on- and off-site training with his supervisors, facilitates communication between his family and Safeway, as well as performs weekly assessments of his work. Mohamud is reliable, punctual and driven. His steady employment has made a positive difference in his life and he continues to learn work and language skills through his job. 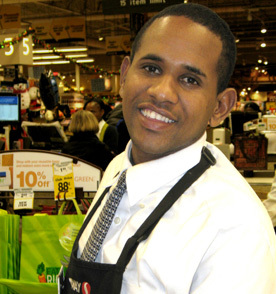 Mohamud loves his position at Safeway and is excited to continue working there for many years to come. After moving to Bellevue from California, Marco and his family knew that he would need help in finding paid employment due to his limited English language skills and a learning disability. The Division of Vocational Rehabilitation (DVR) had him investigate local employment vendors to determine which agency would most closely meet his needs. PSP was his first choice. In our discussions, we learned that Marco wanted to work in food service with a supportive team of co-workers with the hope that some would speak his native Spanish language. After a community based assessment of his skills and abilities, we found that he was very likable, friendly and had an incredible work ethic. PSP used this information to market Marco’s skills in his target area of restaurant utility work. 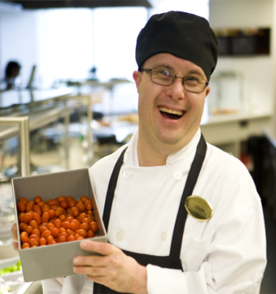 PSP placed Marco in a part time position on the Microsoft campus with Eurest Dining Services doing what he loves to do. 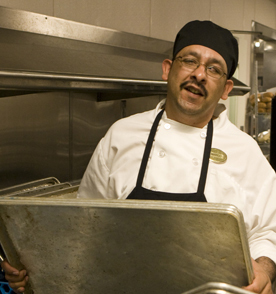 As a utility worker in the kitchen, Marco is part of a wonderful team of co-workers, many of whom speak Spanish. PSP conducted intensive training so that Marco would meet his employer's expectations and be successful in his new position. Since the day he was hired, Marco has not missed one day of work! He says his job is exactly what he was looking for and the Eurest staff are equally pleased to have Marco on their team. Chris has had the opportunity to gain different experiences and build on his skill sets throughout his employment history. Chris was employed with Calzone Company for over 8 years where he was responsible for cleaning trays. He earned the additional responsibility of helping on the packaging line, where he excelled. In January of 2010, Chris was hired at a new cafeteria on the Microsoft campus just a few miles from his home. He is using his skills in packaging and utility work to help in the sushi department. Chris has been able to transfer his skills learned at Calzone & Co to learn his tasks quickly with intensive training from PSP. His previous work experience and interpersonal skills have been a benefit to his new employer. Chris is thriving in an environment where respect, professionalism, consistency and an outstanding work ethic are valued.